Preheat oven to 400ºF/205ºC. Wash the pepper and place on cookie sheet or foil in the oven. Roast for 25-30 minutes, turning occasionally with tongs to blacken each side. Immediately after removing, place in a covered dish or bag to steam for 10 minutes, after which the skin will peel off easily. Skin & remove seeds and stem. Do not rinse, as you will lose the delicious smoky flavor. Place the pepper in a food processor (or use a hand blender like I did for fewer dishes to clean!) until it has reached a paste-like consistency. Pour into a saute pan. Steam broccoli and set aside. Over medium to high heat, heat up the roasted red pepper paste, cream, garlic and salt. Let reduce, making sure not to allow it to boil over. After 7-8 minutes, slowly add most of the parmesan cheese, stirring constantly, until the desired consistency has been reached. 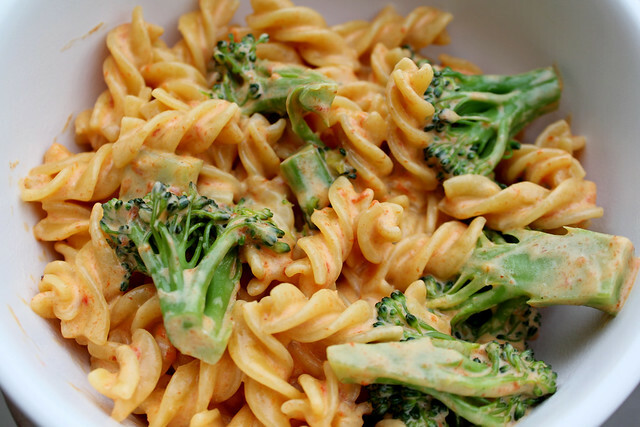 Lower the heat to medium and add in the cooked pasta and broccoli. Sprinkle with parmesan cheese if desired. Salt & pepper to taste. 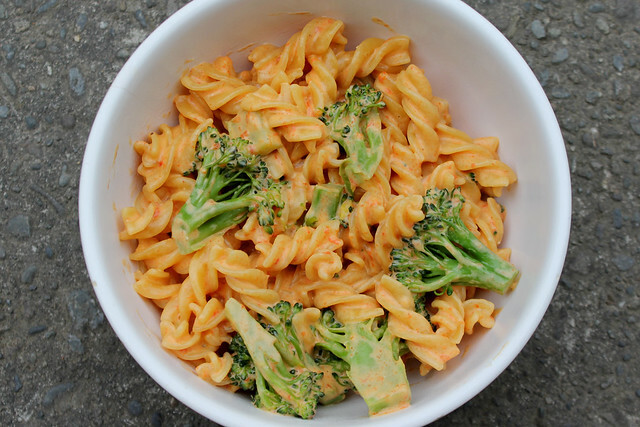 *You can also use cooked chicken breast or other vegetables instead of broccoli, but I think the broccoli and alfredo sauce go together perfectly. I will make this tonight, and will really enjoy every drop of it! Thank you for the tip.